Yup. It sounds technical and difficult. Nobody likes broken links. It’s bad user experience. Your readers DO Google your brand name. You need to control what they see there. If you EVER intend to “do SEO,” you’ll need your website nice and tidy for Google. While running a full SEO and website audit could take hours and encompass looking at a TON of things…there are several quick and easy mini-tests you can run to potentially improve your site! The following tips utilize nothing but free tools, and shouldn’t take you that long. Heck, even if you only see a 0.5% boost in rankings, that’d still be worth it given the small time investment. WARNING: Throughout this entire post, we’re going to assume that if Google could speak, it would sound exactly like Samuel L. Jackson. Let’s fix yo site mutha$&#a. 1 – Is your site being indexed by Google? This tip is mainly for new bloggers. There should be numbers here. There’s a 97% chance you’ll see numbers there. If so, you’re probably good. If not, read this post and fix it. EDIT: Your site can have multiple versions in Search Console! For more about how to group properties, check out this post from Google. 2 – Run a scan for broken links and fix them. There are 1,000,001 ways to check for broken links on your site…but most either involve shelling out $$$$ (I use ahrefs, but Screaming Frog is another) or installing Chrome add-ons. May I present to you, the wonderful Dr. Link Check! This is a fantastic link checker, and the first 1,000 links are free! (I doubt you’ll need more, but this is a great start either way). FAQ – What do I DO with broken links and 404 errors? See the …/shirt URL above on my site, and the “broken” tag beside it? That URL leads to a 404 page. OHHH ok it’s supposed to be gone forever. MY MAN. I got you! I’mma assign all dat OLD link just to yo NEW url. 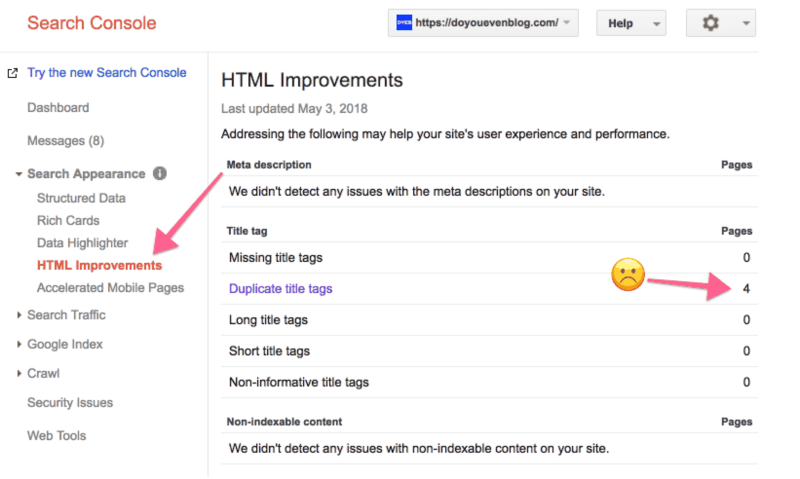 So for any pages on your site that are currently returning 404s, you either want to mark them as deleted in Google’s eyes, or create a permanent redirect to either RELEVANT content, or your homepage. Here’s exactly how you do that. 3 – Make sure Google sees your site as mobile friendly! I’m seriously hoping you’ve covered this already, but if not, use Google’s check er here. If you come up short, honestly you’ll want to change WordPress themes. I know that stinks to hear, but this is important. 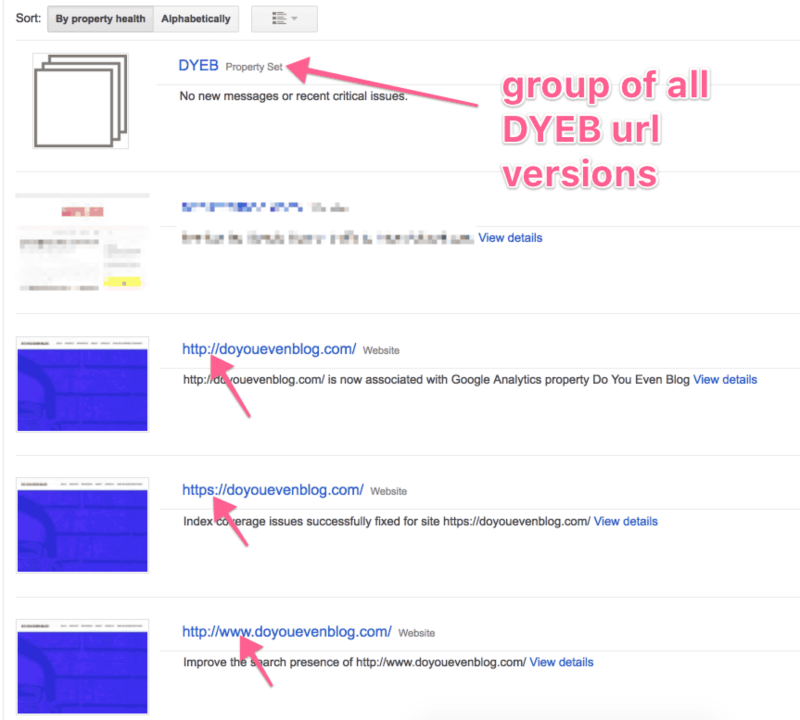 4 – Check your site for duplicate meta tags! Google HATES duplicate content of any kind. I had 2 pages with almost identical title tags. It’ll also show you if you have super short or super long meta descriptions or titles. This is handy too, but you MUST try and fix duplicate content ASAP! Pro Tip: Wanna see if there are duplicates of YOUR content…out there on the internet? Copyscape is a great free tool for this. 5 – Check for crawl errors! Time to head back to your search console and check for crawl errors. Make sure to check the mobile tab too. There are a TON of different (an honestly super weird) errors that Google L. Jackson’s robots could give, and we don’t have time to go into every single one here. If you’re still like “UMM what does this even mean?” Check out this extensive guide to fix crawl errors. 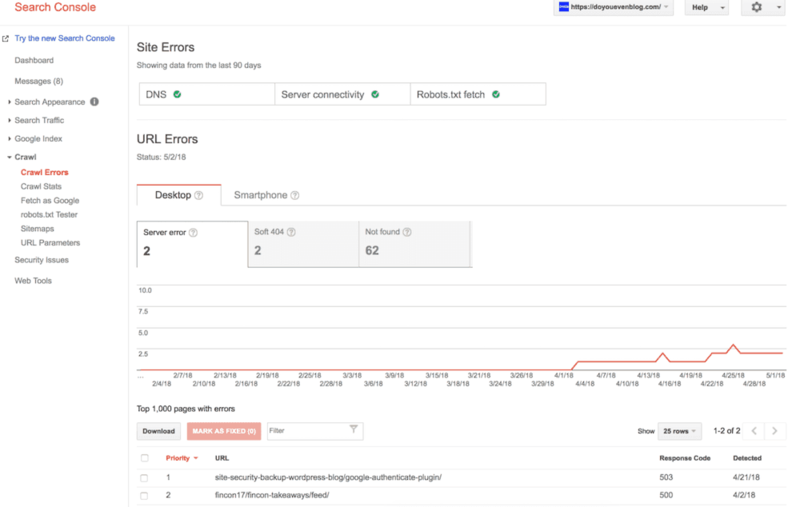 This blog post doesn’t need to cover every single error, as all of you will have DIFFERENT errors, so the Moz post above is incredible for searching for specific errors. 6 – Not really an SEO Audit tip, but check your internal links! Girl you know I love yo internal links! Helps meh figure out what content of you’s is important! Right you are Google L. Jackson. 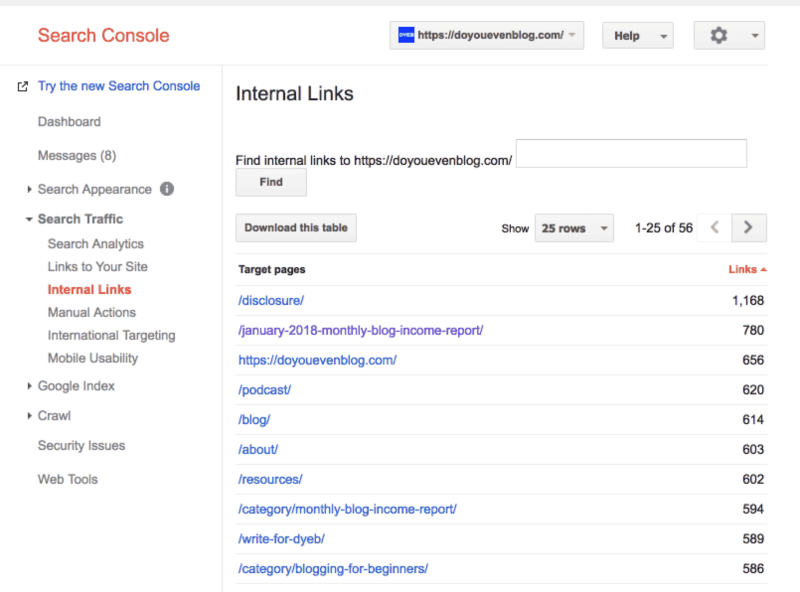 Not only do internal links tell Google which pieces of your content are most important, but they also help your READERS find your best content, keeping them on your blog longer & increasing the chances they become a follower. Most of the top results aren’t actually pieces of content though. Scroll and look for your BEST, “cornerstone,” “pillar” pieces of content, and make sure there are plenty of juicy links there. I recently added Yoast premium to my arsenal of blogging tools, and it actually shows me which posts I want to link out to in my WP dashboard. Handy. I hope you found these SEO Audit tips and tricks helpful. They’re pretty standard practice for the most part…but I’ve found these to be the LEAST time-consuming fixes. I’m dropping a sweet post for how to craft delicious headlines that drive clicks and traffic…by using my two favorite headline analyzers! Bookmarking this so I can check every single one of these and make sure that everything is functioning as should. Thanks for the GREAT list of tips. I am loving your podcast. One of my favorites. I am planning to do ALL this homework this weekend!! Thank you! Thanks for the link to cleaning up crawl errors. I had a few from renaming categories but expect those url errors to not pop up again. Amazing article with very helpful tips! heyyyy! Thanks Jeff. I appreciate you. Only 100% organic grass-fed pure quality here. Pretty much doing that on a monthly basis now. Glad you enjoyed it btw and thanks! Quick question Pete! Late to the party here haha. 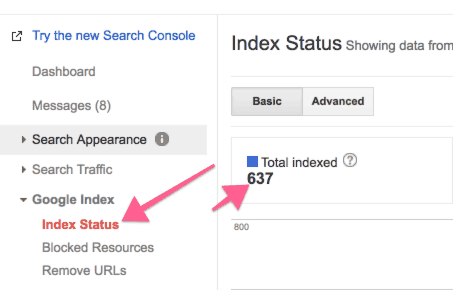 But if you have all four of your properties in search console, and only one – in my case the one I want (https://example.com) – has been indexed by Google. Is that bad/incorrect? Do I need the other three to be indexed? Had a look and couldn’t find info anywhere about this. I assume because they redirect to the indexed URL that it’s fine but not sure. Also, wanted to get out of my lurker ways and say thanks for all the amazing content and, of course, THE PODCAST! All the way from Australia. Cheers! Unless you specifically deindexed them–I’m fairly certain certain Google knows they exist, and if everything IS forwarding correctly–I’d say you’re probably good?